FILE - In this March 9, 2018, photo provided by the U.S. Navy, the aurora borealis displays above Ice Camp Skate in the Beaufort Sea. Scientists are seeing melting in polar regions at times they don't expect, like winter, and in places they don't expect, like eastern Antarctica. New studies and reports issued this week at a major Earth sciences conference paint one of the bleakest pictures yet of dramatic warming in the Arctic and Antarctica. Alaskan scientists described to The Associated Press on Tuesday never-before-seen melting and odd winter problems, including permafrost that never refroze this past winter and wildlife die-offs. The National Oceanic and Atmospheric Administration on Tuesday released its annual Arctic report card, detailing the second warmest year on record in the Arctic and problems, including record low winter sea ice in parts of the region, increased toxic algal blooms, which are normally a warm water phenomenon, and weather changes in the rest of the country attributable to what's happening in the far North. FILE - Narwhals swim between sea ice floating in the Canadian Arctic Archipelago, July 22, 2017. What's happening is a big deal, said University of Colorado environmental science program director Waleed Abdalati, NASA's former chief scientist who was not part of the NOAA report. "It's a new Arctic. We've gone from white to blue," said Abdalati, adding that he normally wouldn't use the word "scary" but it applies. In February the Bering Sea "lost an area of ice the area of Idaho," said Dartmouth College engineering professor Donald Perovich, a report card co-author. This is a problem because the oldest and thickest sea ice is down 95 percent from 30 years ago. In 1985, about one-sixth of Arctic sea ice was thick multi-year ice, now it is maybe one-hundredth, Perovich said. "I left Nome and we had open water in December," Sheffield said at the American Geophysical Union conference in Washington. "It's very much impacting us." "Having this area ice free is having this massive environmental change," Sheffield said, adding there's been a "multi-species die off" of ocean life. She said that includes the first spring mass die off of seals along the Bering Strait. Ornithologist George Divoky, who has been studying the black guillemots of Cooper Island for 45 years, noticed something different this year. In the past, 225 nesting pairs of the seabirds would arrive at his island. This past winter it was down to 85 pairs, but only 50 laid eggs and only 25 had successful hatches. He blamed the lack of winter sea ice. FILE - This undated aerial photo provided by U.S. 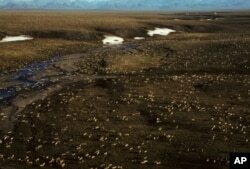 Fish and Wildlife Service shows a herd of caribou on the Arctic National Wildlife Refuge in northeast Alaska. With overall melting, especially in the summer, herds of caribou and wild reindeer have dropped about 55 percent — from 4.7 million to 2.1 million animals — because of the warming and the flies and parasites it brings, said report card co-author Howard Epstein of the University of Virginia. Because of warming, the Arctic is "seeing concentrations of algal toxins moving northward" — infecting birds, mammals and shellfish to become a public health and economic problem, said report card co-author Karen Frey. But it's not just the Arctic. NASA's newest space-based radar, Icesat 2, in its first couple of months has already found that the Dotson ice shelf in Antarctica has lost more than 390 feet (120 meters) in thickness since 2003, said radar scientist Ben Smith of the University of Washington.